Families are their children's first teachers. 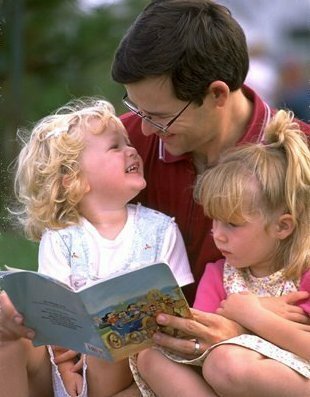 As a family member you begin teaching your babies about language as you welcome them into the world with smiles and caring words. You respond to your children's coos, babbles, early words, and simple sentences. By the time your children are preschoolers, they know a lot about language. You have spent many hours listening, talking, reading, and writing with them. Most of the activities here are simple to do with materials found in your home or at the library. The activities can be added to your life at home as you and your children play, work, and grow together. The ideas for one age group may also work for a younger or older child. Using what you know about your child's skills and interests can help you decide which activities to use.